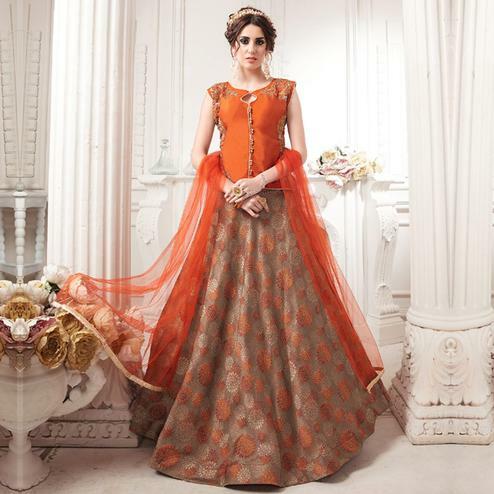 Peachmode has a gorgeous collection of lehenga online in various fabrics and patterns. 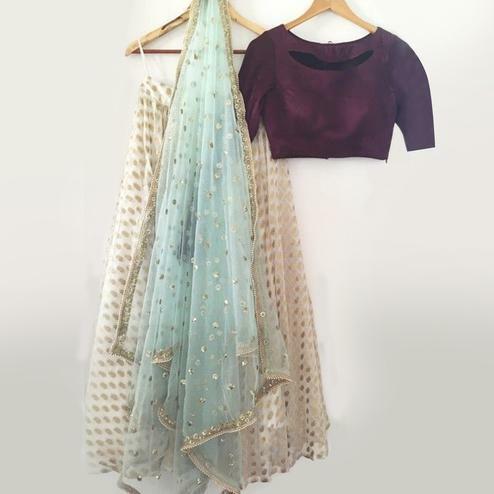 The collection is regularly filled in with latest lehenga styles to cover all your fashion wishlist. Of the numerous lehenga styles that we have with us, jacquard lehengas are grabbing everyone’s attention. 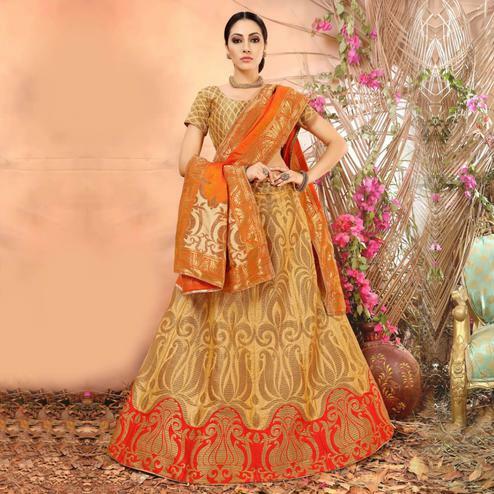 The jacquard fabric lehenga at Peachmode comes in exclusive style patterns- motif work, floral embroidery, woven embroidery work, laced border, embroidered border, woven embroidery work, zardozi work, brocade work and many more. These lehenga designs weave pure magic and are gracious as ever! Jacquard fabric has patterns woven into the fabric. As opposed to printing the patterns, these woven patterns look more enhanced thus adding an artful touch to the outfit. These raised patterns are woven in many varieties- florals, abstract, traditional and so on. This type of fabric design first surfaced in the 1800 and is quite a popular choice for wedding outfits owing to its royal appeal. Jacquard lehengas have an ornate weaving, an essence of our rich and royal culture. Crafted with hints of modern style, these lehengas are fused with traditional sentiments reflecting the grandeur of weddings! Our brocade lehenga carries a very ethereal and artistic beauty and is a great outfit choice for wedding outfits and even as a bridal lehenga. 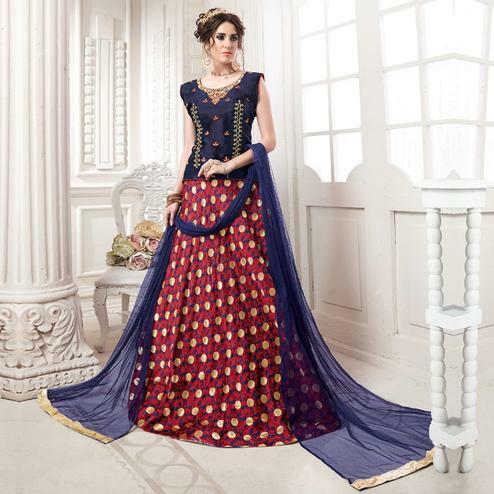 The jacquard lehenga material in itself has a very regal and majestic vibe associated with it. 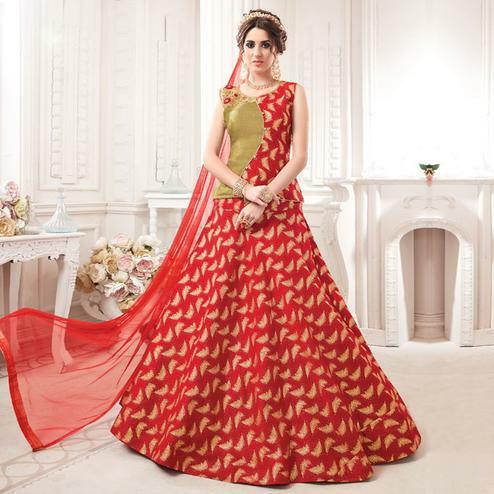 You can also drape these lehengas as lehenga saree and accentuate its grace further. 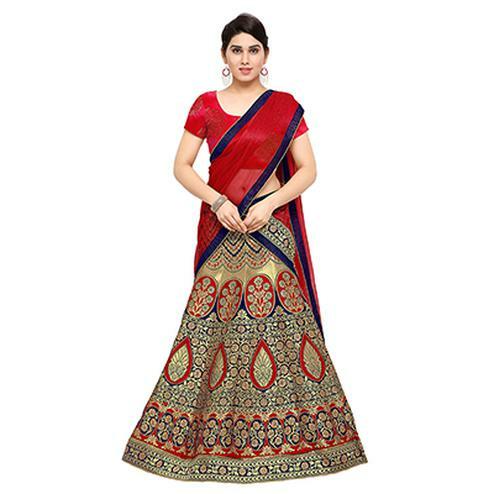 We have these jacquard lehenga choli in gown styles as well. These blouses are also done very artistically in fabrics like tapetta silk, net, raw silk, banarasi silk, banglori silk. The sleeves are contemporarily styled with choices like cold shoulder, bell sleeves, embroidered sleeves. The neck is also styled in stand collar, peter pan collar, round neck collar, embroidered collar and so on. The dupattas are co-ordinated beautifully in likes of chiffon, net, lycra with subtle work done on them. We have various beautiful color options in navy blue, red, pink, maroon, beige, green, orange, golden, turquoise, tel, peach, purple, cream, sky blue and many more. 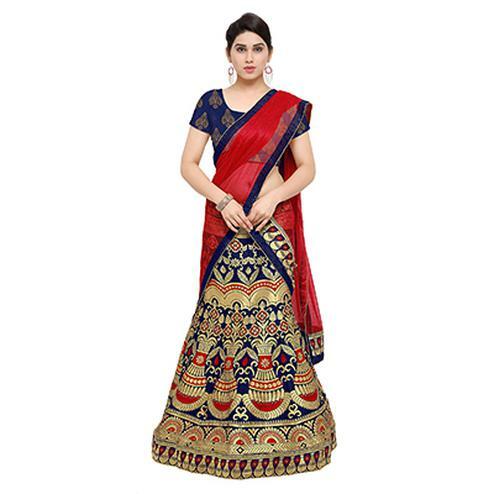 So don’t wait any further and quickly fill your shopping cart with these marvelous lehengas at Peachmode! They are simply gorgeous and are affordably priced- you’d keep coming back to buy more!